Show me a dessert menu and I can tell you what I would order. If there is chocolate, that is it. If the chocolate is paired with caramel, I might hunt the server down to get our order in sooner. No chocolate? Fruit is all right, especially if it is an apple pie type thing in the fall or anything having to do with berries in the summer. Sometimes a lemon tart can be nice. After that, we kind of get into a no-man’s land of desserts for me. Tiramisu, cheesecake, crème brulée – all things I would order really only under duress. Like if I’m dying to have something sweet and there is no other choice. Flan? 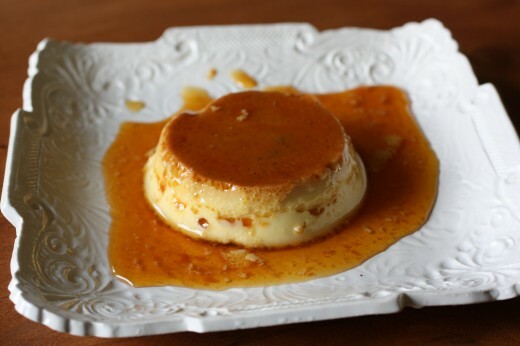 Or the French cousin crème caramel? Not on my radar. No eggy custard for me, thanks. That is until recently. 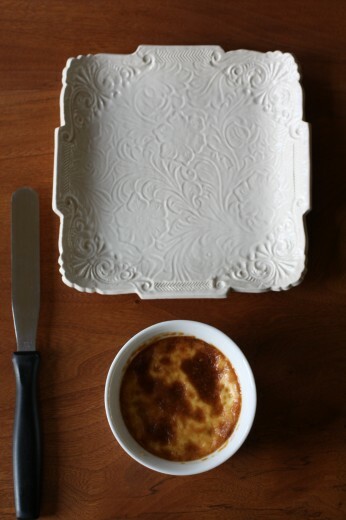 This month I taught three versions of my Spanish cooking class and I put flan on the menu. I usually try to include at least five dishes when I teach and I was going back and forth between doing another savory (gazpacho) and doing sweet (flan). I remembered that I taught gazpacho last summer in a “beat the heat” class (which was funny because we had very little heat last summer), and there is nothing that interesting about watching me chopping vegetables and pouring tomato juice over them. So, flan it was. In order to make flan you make two things that seem to scare people. Caramel and custard. Being able to walk students through both of those tasks was very satisfying. Because flan needs to be made the night before it is served, we had a lot of flan around here. I would demonstrate how to make it and then the students would eat what I had prepped the previous day. That meant that the version I made in class became our property the next night. Brilliant, huh? Who knew, but I really like flan. As I was searching for recipes, I found countless versions (coconut, pumpkin, eggnog, lemon, dulce de leche, even asparagus!) but I opted to stay classic with this one. I made it in both individual ramekins and also in a larger soufflé dish which makes a very impressive presentation. Now that I have made it many many times, here are some tips. First, the caramel. I will tell you what anyone who has ever written a recipe for caramel will tell you – molten sugar is H-O-T so be careful when working with it. Take your caramel off the heat about ½ a shade lighter than you actually want it (just shy of deep amber), because it will keep cooking and quickly. This is especially true if you are pouring it into individual ramekins which takes more time than putting it in a big dish. Whether you are using several small or one big vessel, cover your hand with an oven mitt when doing the tilting to cover the bottom and sides of the dish(es). That way if a little caramel escapes, you won’t burn your hand. Second, the custard. No big insight here but I do find it helpful to put a piece of wet paper towel under the bowl where the egg yolks and sugar are. This way you can whisk with one hand and pour in the milk/cream mixture with the other without your bowl rolling all over the place. I do this when I make ice cream too. Third, removal and clean-up. You will bake your flan in a water bath. You will remove it from the baking pan and let it cool. You will refrigerate it overnight. You will take it out right before you are going to serve it and you will think, “There is no way this is coming out of the dish.” And you will be wrong. Trust me. I know it looks like it’s in there forever. I know it doesn’t make logical sense that you would coat the bottom and sides of a dish with molten sugar which hardens almost immediately on contact, fill that dish with custard, bake it, cool it, and refrigerate it and this thing that you created would not stick for all eternity. I don’t know, magic happens in the kitchen sometimes. Arm yourself with a palette knife or a very thin regular knife and run it around the edges of the dish. Turn over onto a plate and it should just thwop right out. (That is kind of the sound it makes.) If it doesn’t, just repeat the knife technique and try again. All of my many flans came out intact with a perfect puddle of caramel on top. What you are left with is a dish (or dishes) that have some of the baked on caramel left in the bottom. It looks kind of like a stained glass window. It can be hard to get out. My advice is just to let it soak overnight and it is easy to clean the next morning. Wowza, I sound bossy. Not trying to be so, just trying to get you to make flan! If you happen to have 8 ramekins, this amount will fill 8 but 8 ramekins will not fit in a 13×9-inch pan. If you want to serve 8 people, my advice would be to just make it in a large dish instead and cut it into slices. Position rack in center of oven and preheat to 350°F. Combine cream, milk and salt in heavy medium saucepan. Scrape seeds from vanilla bean into cream mixture; add bean. Bring to simmer over medium heat. Remove from heat and let steep 30 minutes. Meanwhile, combine 1 cup sugar and 1/3 cup water in another heavy medium saucepan. Stir over low heat until sugar dissolves. Increase heat to high and cook without stirring until syrup turns deep amber, brushing down sides of pan with wet pastry brush and swirling pan occasionally, about 10 minutes. 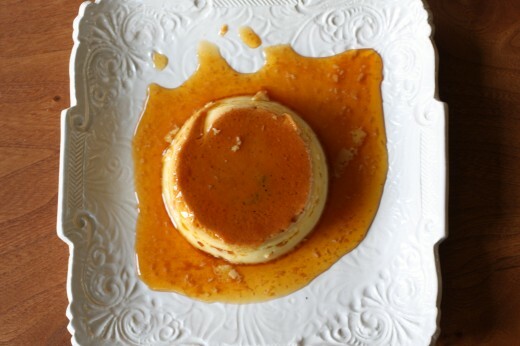 Quickly pour caramel into six 3/4-cup ramekins or custard cups. You can also use a 2 or 3-cup soufflé dish. Using oven mitts as aid, immediately tilt each ramekin to coat sides. Set ramekins into 13x9x2-inch baking pan. Whisk eggs, egg yolks and 7 tablespoons sugar in medium bowl just until blended. Gradually and gently whisk cream mixture into egg mixture without creating lots of foam. Pour custard through small sieve into prepared ramekins, dividing evenly (mixture will fill ramekins). Transfer the pan with the full ramekins to the oven. Carefully enough hot water into baking pan to come halfway up sides of ramekins, making sure not to splash any water into the custards. To serve, run small sharp knife around flan to loosen. Turn over onto plate. Shake gently to release flan. Carefully lift off ramekin allowing caramel syrup to run over flan. Repeat with remaining flans and serve. I don’t think I’ve ever really been a flan person either (but I would order creme brulee over chocolate in a heartbeat…this might be the only foodie point on which we differ) but I could be convinced otherwise. One of my friends used to make it all the time in college and I think maybe his was just not that great so I’ve always had a bad impression of it. It’s definitely worth trying again though! I’m a recent caramel-custard convert too. And I think I’ll be keeping it around me for a long time. Yours look gorgeous! Hi Dana, I loved this flan. I want to make it after my kitchen remodel is done. It will be the celebratory dish. I might even consider getting the dish you have displayed it on. It is exquisite.